Fiji was a great introduction to the South Pacific and now it was time to move on to the next country. We said our last bulas to the hotel staff and headed to the airport. We were about to pull off a previously unattempted maneuver: I was going to leave the group mid-trip then meet back up with them later. I think it was a pretty solid plan. They had some pretty cool sounding things on their agenda in the Sydney, Australia area including a wildlife winery thing that I was jealous about. I on the other hand, have already been to Sydney and I thought I should take advantage of our horrendously long flight here to poke around a bit more in the Pacific island neighborhood. My next destination was Vanuatu. Things started off nicely. Lydia and crew was stuck in line waiting for their budget Australian airline's check-in booth to open. 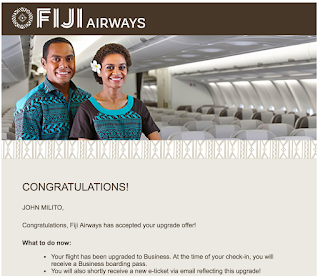 While I was gliding through the Fiji premium class check-in. Months ago when I booked my Fiji Airways ticket to Vanuatu I just went with the cheapest flight available because money is my favorite. A little later I got an email inviting me to make a "bula bid" on an upgrade to business class. Sure, why not? I bid the lowest possible amount, which was about $50. Well this auction clearly didn't have many bidders because I won. After security I made my way to the Fiji Airways Tabua Lounge. There were a couple of signs indicating that it was being renovated and that the room I was going to was a temporary setup, but I didn't care. The furniture was basic, but whatever. The food and drinks however were solid. I may have shoved a few last bottles of Fiji water into my bag just in case times got tough at my next destination. Couple different kinds of quiche. The food options weren't insanely plentiful but what they did have was really good. The ladies arrived and I was able to get them all in with my trusty Priority Pass. Took about three minutes for the first champagne cork to hit the ceiling. I felt good about being able to get everyone in the lounge. They had quite a bit of time to wait so now I didn't feel so guilty when it was time for me to board. They were in good hands. Unsurprisingly my flight left on Fiji Time as well. This was a new one for me. There were a bunch of random advertisements on the Vanuatu immigration card. You can see the girl in the middle there has a Cardinals hat. I asked if they lived in St. Louis and they said yes. We had some time waiting in various lines so I told them what neighborhood I live in in St. Louis and everything and then asked the same of them. They just looked at me blankly. Turns out they live in the rural southern Missouri "bootheel". Their cool points dropped so low so quickly that our conversation ended soon after. Their skirts and weird hair confirmed that they were here on some mission trip. Immigration wanted to see my hotel confirmation printout. I'm just really annoyed when people ask for things like this. Surely there are visitors who don't walk about with a folder filled with printouts like I do. I learned the hard way. My base of operations for Vanuatu was Port Vila, the capital. New Caledonia to the southwest is not a country and so I won't be going there. This second map view is entitled "Ok, but where the hell is Vanuatu?" One thing that struck me during my reading of the history of Vanuatu was its odd colonial history. Before they gained independence the islands were known as the New Hebrides. Ok. 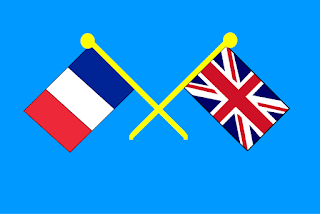 Sovereignty over this colony was shared by Britain and France in an arrangement known as a condominium. I've never heard of such a thing. I'll let Wikipedia explain how uniquely inefficient this turned out to be. And what a fantastically imaginative flag that colony had. There was actually a guy waiting for me with a sign which I appreciated. It was funny though, he was waiting but all he did was tell me to sit down and wait for another guy with a car. Ok. Took the opportunity to grab some money from the ATM. It was pretty slick looking. A famous bit of native Vanuatu culture is a form of bungee jumping. It looks terrifying as the entire thing is built with wood and vines and so forth. Getting into a car with a stranger in a strange land feels like a little leap of faith every single time. From the car window I felt like I was looking at a less developed version of Fiji. I laughed when I saw the sign for a knock off "Pizza Hot". There were children playing soccer in the gravel next door. I'd booked a private room in a two room apartment. My room was pretty small and had a bunk bed. I don't know if two bunk beds would have fit in there side by side. There was an oscillating fan which was nice to have and a dresser. I was pretty tired and it was starting to get dark so I decided to just chill out and then go to bed pretty early. The end? Nope. I awoke to knocking and my name said a few times through the door to the outside. I was pretty disoriented and figured that it must be daytime. I looked at my phone to check. It was 4 am. Irene, the girl in charge of the Airbnb who I'd written to a bit introduced herself. She proclaimed that her three friends were here too and wanted to have a party in the apartment tonight. Ok? The guys that followed in were all very gay and dressed like it. They had long fingernails. One was kind of chubby and reminded me a lot of CeeLo Green. One had like a long jerry curl type hair with blue contacts in and works for the local airline in catering. The third was a skinny little tattooed bartender with a couple gold teeth. The weird fingernails, sort of flamboyant dress, and the creepy blue contacts gave this crew a decidedly vampiric vibe. Bartender was wasted and was adamant that I drink with him. I took a few polite sips out of a plastic cup of wine but that was it. He probably offered 10-15 times. A bag of frozen chicken materialized and they made CeeLo fry it up in the kitchen we were now sitting in. Despite the fact they woke me up at 4 I was surprisingly not annoyed. I think I was just so disoriented by what the heck was going on here, and very tired, that I didn't have the energy to be annoyed. And I must say aside from barging in they were all very polite. It was funny I sort of felt like the rude one by the time I went back to bed because I refused the offered drinks and the soon-to-be-fried chicken so many times. Clearly this was Irene's fault. Someone else had given me the keys earlier today and it was unclear if Irene had even remembered I was staying here. The doors to the outside had a couple of bolts each so she might not have realized I was even in there until she couldn't get the door open. Irene also said I had only booked one night, so I was freaking out about that until I found my trusty printout showing two. Today's travel tip is: print out every reservation you have for international trips. People are out there creepin' and might try to mess up your plans otherwise. Why oh why did I have to go off traveling on my own? I always say I wish I could meet more locals. Be careful what you wish for.